On Sunday 22 March, Cardinal Vincent preached at a service of Compline for the reception of the remains of King Richard III at Leicester Cathedral. Cardinal Vincent joined the Bishop of Leicester, Rt Rev Tim Stevens, as well as representatives of other Churches and religions from across Great Britain at the reception of the king's remains. Alluding to the community of Franciscan Friars who buried Richard 'with formal prayer even if also in haste', the Cardinal noted that stones from the Greyfriars Church were used in the 16th century to repair the St Martin's Church, which is now Leicester Cathedral. 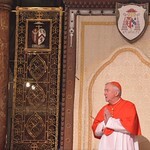 The full homily can be read here.